The idea of “little bets” has manifested in my work in the form of reframing my approach to design with a focus on better horticultural practice. One of my core motivations for pursuing a career in landscape architecture was my deep interest in plant materials. This has been stirred by recent exploration of books such as Jim Urban’s Up by Roots and Gary Smith’s From Art to Landscape. I will admit that my years of practice have gradually led me away from sound horticultural practice, with a more attention paid to general aesthetics. However, it is never too late to get back on the right path. 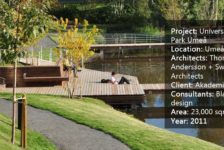 One of the core value promises of landscape architects will always be in our ability to deliver growing and vigorous environments. Much of my work is concentrated in Texas, a state where nearly every major metro area and downtown is experiencing an influx of new development and investment. This growth is driving a rapid implementation of a new generation of urban streets with mixed results. The task of planting urban trees is not new, but the horticultural factors associated with urban areas are not always easy to navigate in the world of municipal code, utility regulations and contractor culture. Designing adequate space for tree growth and soils requires us to break away from a culture of tree grates and tiny planting areas. Products have started to emerge, such as Deep Root’s Silva Cell system, which begin to address this issue. These systems provide a suspended paving condition, allowing horticultural soils to be placed between walking/driving surfaces and native subgrades. 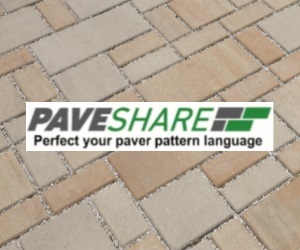 The use of suspended paving systems is not yet widely adopted, including within the Texas market. There is limited documentation of installed applications in public or private projects, and little to go by for contractor cost estimate sheets. Another consideration is that many “great streets” or “complete streets” codes were written before designers were engaged by work such as Up by Roots, and its associated technologies. Municipal regulations tend can be very difficult to change and design/construction timelines are averse to such risk. 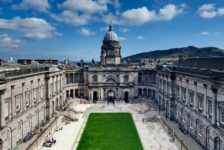 Any given culture of contractors has a similar relationship to new things, which tend to be greeted with padded budgets that can absorb a range of unforeseen considerations. A combination of cost and uncertainty is often the terminus of systems such as Silva Cell or even structural soils. Silva Cell installation in progress at Midtown Park, Houston, Texas. 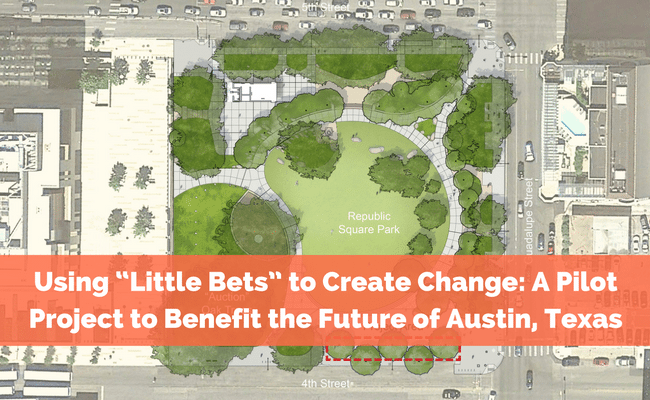 In Austin, a group of interested stakeholders took advantage of a tree planting project associated with renovations of Republic Square, a high profile historic downtown square, to provide an opportunity to make a ”little bet”. If our project was to follow Austin’s standard approach to tree planting, we would be providing around 108 cubic feet of soil (the size of a standard tree grate, at about a 3 foot depth) that is of a known horticultural quality. Knowing this, it is easy to understand why the typical life of an urban tree is often short. Trees are starved, weakened, and easily finished off by drought or insect damage. Concepts presented by both Jim Urban and Cornell University’s research suggest that shade trees need between 800 and 1,500 cubic feet of material to thrive. For reference, that is about the same area taken up by two surface parking spaces. What we know about the serious establishment of an urban forest is in direct conflict with common practice and available tree planting space. As a proud Austinite, I am convinced that we can do the right thing. Austin has a great tradition of valuing and nurturing our urban forest, dating back to our tree protection ordinance adopted in the 1980’s. Up By Roots explores urban tree issues in a way that is easy to understand and apply. To begin the investigation of this opportunity, I had to establish some sort of working budget and funding sources. The first step was to develop a basic design for a Silva Cell system, request a quote for those materials, and request an installation estimate from our contractor at Republic Square. With this information, I began by asking for contributions or discounts from associated vendors. DeepRoot, Cleanscapes, and Whittlesey Landscape Supply all committed to some level of support, recognizing the long-term benefits of the project. The remainder of the funding became the pressing matter. With the budget for Republic Square’s construction already at a maximum, I had to look for other partners. Fortunately, this “little bet” has coincided with some city-wide urban forestry efforts, including Austin’s “Code Next” municipal code update and Green Streets program. Austin’s City foresters recognize that the urban forest is an essential piece of infrastructure and have been reviewing the tools available to move our city forward. The ability to test a new approach at Republic Square gives our City leadership an opportunity to test and observe a technology before working to apply it at a much larger scale. After discussing goals the City was hoping to achieve within their code and program efforts, we elected to move forward with a target of 1,000 cubic feet of soil per tree. The City of Austin Community Tree Division stepped forward with the funding and contingency needed to move the project forward. 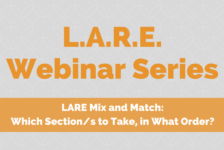 This organization within Austin aims to improve the livability of the city by promoting a wide range of tree-related projects and enforcement of our tree ordinances. 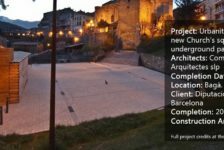 The investment of time and money in this project reflects a desire to learn about the implementation process and associated costs of a structured paving solution to tree wells. Documentation of the process is focused on how cost and effort may be anticipated as we plan for future trees around the City. We will actively track and document the implementation of the project to get a sense of the process, but more importantly, to understand the effort behind implementation. This will allow the development and contractor community the information needed to plan appropriately for costs. Because these types of technologies are relatively new to our local contractor community, there is a risk contingency built into the costs. With proper reporting, we should be able to reduce this risk, thus reducing overall costs. The second focus is to monitor the health and growth of the planted trees over time and compare the data against conventionally planted trees. Healthy trees have a well-documented value on many levels, and testing how much health value this product delivers is an important part of the story (one such example is New York City’s urban tree initiative, in which thousands of volunteers created an interactive database providing fiscal value to every urban tree in Manhattan). Lastly, we are installing monitoring points tied to our underdrain system to show how this type of planting system can contribute to overall water quality for a project, and how it might count toward the various water quality strategies used within a larger development context. The cost data is expected to be published sometime in 2017, with tree growth and water quality information data to be collected the over coming years. As professionals, we can use “little bets” to shape a larger story. These efforts can be modest, delivering a better product or process within the context of your own practice. In terms of horticulture and planting design, we can test things as simple as new plant types/cultivars and establishment methods. In the case of our pilot project in Austin, we are hoping to grow a larger story out of our small example. I would ask you to consider intentionally developing and telling people about your “little bets”, both successful and not. Sharing of knowledge benefits our profession, benefits the contractors associated with our work, and strengthens the value we provide to society. Update: The excavation for the Republic Square install is underway. Our work area should be fully cut this week and base materials will start to be installed. We will be placing the first layer of soil cells next week, along with the drain pipes and other utility features that need to run through the soil zone. Our camera is set up and collecting data as progress continues. Soil excavation zone in progress. The area is being excavated to about 36” depth and will be compacted in preparation for base materials. Soil excavation section. As expected in a downtown setting, layers of fill or bedding materials have been placed over decades of development. This particular area includes at least 3 layers of imported material over the native subgrade, which appears to be a rocky/sandy silt. This soil type is great in terms of percolation and drainage for the tree zone. 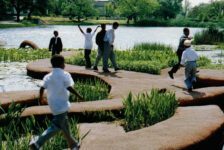 Philip Koske, PLA, ASLA is a landscape architect with Design Workshop in Austin, Texas. His work ranges from rural parks and open spaces, to urban streetscapes and civic centers. James Richards sketching techniques online!